When we compare Tallahassee house prices today with those right before the surge in the real estate market, there is not much of a difference. Though new construction prices have risen 16% in the past ten years, existing Tallahassee house prices have only risen half as much. Were we to end the analysis at this point however, the real story would be completely missed. Currently, there are more homes for sale in the Tallahassee MLS than there were back in 2005. And when we look at a real estate graph of Tallahassee house prices recently sold, we can see that the average single family homes price today is consistent with what buyers were spending back in 2005. Townhouse and Condo buyers are paying the same amount as back in 2004. Does this mean that home values are the same as they were back in '04 and '05? These graphs show market averages, they do not show what is actually being sold. For instance, what did you get for your money in 2005 compared with what you get today? 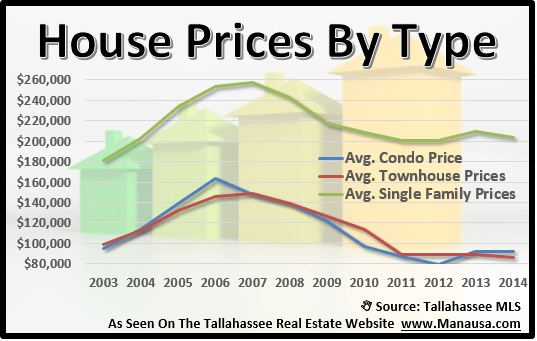 If the Tallahassee house prices did not change, did the houses change? When we study average home sizes, we find that $180,000 buys a whole lot more in 2013 than it did in 2005, meaning values have declined greatly. But there is another story here as well. With more than 70% of homebuyers in Tallahassee relying on third-party financing to purchase a home, how do mortgage rates figure into the whole picture? The lucky homebuyer of today get's a much better deal. The $180,000 house is bigger (home values have fallen), and the monthly payment has fallen due to the changes in mortgage interest rates. For example, comparing somebody financing a $180,000 home in 2005 versus 2013 at market rate for thirty years (assuming a minimal 5% down payment), the table at the left shows today's buyer is paying 24% less each month for a home that is up to 35% nicer! That is what we call a positive move in home affordability for home buyers. And it is also the reason that we warn of changes when mortgage interest rates begin to return to normal. The graph above is a good warning that these low rates won't be around forever. 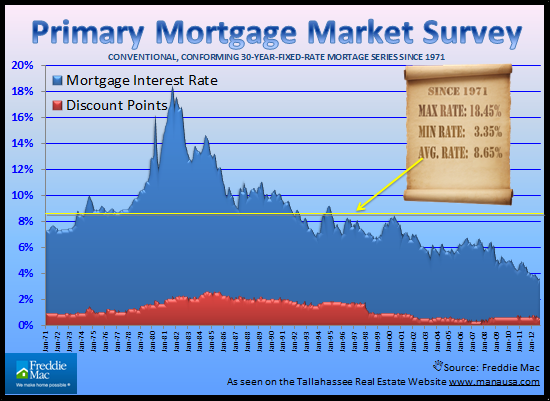 If you want to know how to take advantage of low interest rates and great Tallahassee house prices, just drop me a note and we can schedule a time to review your specific needs and wants.